This larger coupling is best used on boats with an on water weight up to an 8 tonne maximum and suit vessels ranging 6-10m in length. Note: couplings may be used on applications over this weight at the owners own discretion and risk, or talk to us and we can explain. Boatcatch is a patented boat trailer accessory which makes launching and retrieving your boat on the boat ramp quick and easy. After it’s installed, you won’t have to even stand on a ramp ever again. No wet feet and no slipping on muddy, slippery ramps. Best of all, you will also save time and prevent arguments. Once installed, Boatcatch allows you to launch and retrieve your boat in as little as 20 seconds with just 2 people. Spend less time on the boat ramp and more time enjoying your boating. If you want to get technical, Boatcatch is a coupling system which helps form a quick release connection between your boat trailer the bow of the boat. 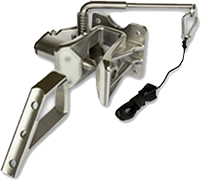 There are two sizes and Boatcatch is supplied as a kit complete with a universal mounting bracket and all components you will need for your boat-trailer arrangement. With complete instructions supplied and online or phone support, our product is easy to install and can be fitted by the average handyman. Boatcatch, what a time saver. No messing around on slippery boat ramps while trying to do your boat up. In and out in a matter of seconds. I highly recommend it. My Boatcatch is awesome, I had the oppositions product for a year which was real pain to use, I removed it for a Boatcatch fitted very professionally by Dave Muscat in Sydney, extremely well built product. A Great Product, wish we had it years ago. Launch and retrieval is much safer and quicker. I fitted the Boatcatch up to my CruiseCraft and what a difference, no more wet feet hooking and unhooking the boat and so safe and easy to use. The Boatcatch is far and above any other unit I have experienced for quality, robustness and ease of use. I bought my Boatcatch after my wife almost lost a finger on boat retrieval. I am not a super experienced boatie but not a novice either and this is definately the best thing I have bought for my boat. I cannot imagine boating without it now. After 40 years of using boat ramps while commercial fishing with small boats, the last two have been heaven. We are now very used to using our Boatcatch and so our ramp work is extremely slick. People watch in amazement at the speed of our docking. The car is often on the ramp for only 10 seconds. It is also much safer not getting out of the car. Great invention! 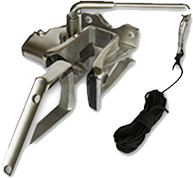 The Boatcatch is well made and extremely well engineered. I endorse the statement that it will not release accidentally; none of the normal forward-backward force of the boat is translated into the side-to-side release mechanism. You do not have to run at the trailer as some like to do, nor are you obliged to creep the boat on. I recently purchased a boatcatch from you guys at the Sydney Boat Show, I installed it on my Ocean Series Tabs (alloy) which is on a Dunbier trailer. Fitment was easy and went to plan as you guys described, thanks for the tips. i did not need any additional parts, was all in the box, I welded the aluminium block supplied on to the hull, looks like it has been there since day one as part of the boat. I have used the catcher now several times on our local ocean boat ramp (lots of surge etc) and has worked perfectly on and off every time, is a well engineered and simple design, my crew loves it , dry feet for everyone!! I bought the larger boatcatch version for my 24′ Haines cat, at the Melbourne boat show last year. Best money I ever spent. At the ramp, my girlfriend backs in, and I run the boat up the trailer till I hear the pin slam across. As soon as this happens, she pulls up the ramp with me giving the truck a gentle push with the outboards – shutting down when the props leave the water. This is a pretty big lump of boat as far as trailer-able goes, and I go from being afloat, to car park, in less than 30 seconds! I get a lot of smiles and comments, that’s for sure. Thank you for this GREAT product. Very happy. Flippin’ awesome is how I describe Boatcatch. Its convenient, time saving, safer, efficient, and it looks great! Its just like bling for my boat! There are no more soggy feet and I never have to get out of the car. Send me some brochures because people are always wanting to know how I just did a launch or retrieve so quickly with such a big work boat without even getting out of the vehicle. Thanks!